Storage: This product must be stored in the fridge at all times when not in use to keep fresh. Our Hair Regrowth Serum has the award winning Rendesyl ingredient (3%). The controlled test studies which achieved amazing results were conducted with only 1% as shown later in this write up. Redensyl is the newest breakthrough against hair loss, and the best alternative to hair transplantation. Redensyl can help significantly boost hair density, thickness, fullness, natural colour, strength and overall health. This serums powerful active ingredients help both men and women. Redensyl is the first hair care cosmetic active ingredient based on regenerative medicine researches, that gives better results than a surgical procedure for hair transplant in 84 days. This product targets stem cells and human fibroblasts from the dermal papilla to improve hair growth while reducing hair loss. 1) Provide an energy source for the hair cells. 2) Protect the cells from environmental aggressions (Sunlight, Pollution, etc) which can accelerate hair loss. All the active ingredients are carried in a serum featuring a unique blend of hyaluronic acid and lecithins which combine to enhance delivery and absorption of the actives into your scalp. Unlike Minoxidil containing products there are no side effects or health issues associated with the use of Redensyl. Unlike rinse off products which seem self defeating, our product is a leave on product which creates the best possible scenario for allowing the active agents to work. The scalp bears an average 110,000 hair follicles which, at different rates are growing and falling on a daily basis. When the balance between the growing hair and the falling ones is altered, then hair loss starts and baldness appears. 1) Re-launching stem cells activity and proliferation. The outer root sheath stem cells (ORSc) are vitalized, thus triggering a new hair cycle. 2) Increasing the dermal papilla's fibroblasts metabolism. 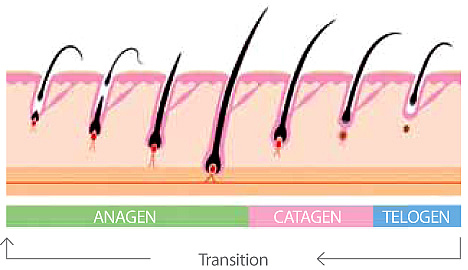 Hair follicles are nourished resulting in the stem cells switching on the anagen phase faster. Uni-protect T-43: is another main ingredient, and the main reason for its inclusion is that “Uni-protect T-43” contains a chemical called ATP. This is the energy source that cells require in order to divide. It works like this, first Redensyl wakes the cells up in the scalp, the “Uni-protect T-43” ATP then provides cells with the energy boost to trigger cell division and growth. “Uni-protect T-43” also contains chemicals that protect the skin from UV radiation. When you think about how many people with thinning hair end up burning their scalp, its a good ingredient for us to have included in our hair serum. It is a known fact that 40% of men will have noticeable hair loss by age 35. This number reaches 65% by 60 years of age. Women are also deeply impacted by such process: 50 to 75% suffer noticeable hair loss by age 65. Hair loss can be devastating to one’s self image and emotional well being. Phase three is followed by the anagen phase once again when regrowing hair.. When suffering from hair loss, the telogen phase is prolonged, and the transition to the anagen phase becomes more difficult. Hair becomes thinner and the percentage of hair transitioning to the telogen phase continues to increase. The problem comes from the fact that the hair follicle stem cells are less productive, and less adapted to improve the quality of the matrix (made of keratinocytes) supporting the hair follicle growth. Furthermore, the fibroblasts located in the dermal papilla (also called HFDPc) are less efficient in communicating with the stem cells, meaning that the matrix will not be renewed as it used to. Initiating the anagen phase becomes more sluggish, and hair loss becomes a part of daily life. Our product effectively reduces the Telogen phase and increases the Anagen phase, hence hair is re-grown and maintained effectively. Several of the most popular hair growth products are shampoos or caffeine liquids. Just have a think about this for a moment. A shampoo is designed to be rinsed off the hair shortly after use, so any active ingredients contained in the shampoo are rinsed off. So what's the point? Even if some of the active ingredients remain on the hair and scalp they are unlikely to have any effect due to being diluted with water. The two main ingredients in such products are caffeine and niacinamide and these two active ingredients are designed, in a product such as hair growth shampoo or liquid, to stimulate blood flow. The argument is that stimulating blood flow brings oxygen and nutrients to the hair follicles and promotes growth. The fact is, that blood stimulation via the little caffeine and niacinamide that might remain present on the scalp, is so minimal that the actual act of massaging the scalp whilst washing the hair will stimulate blood flow just as much without the shampoo product, so our advice is not to waste your money on those products. Severe allergic reactions (e.g. rash, hives, itching, difficulty breathing, tightness in the chest, or swelling of the mouth, face, lips, or tongue). Sudden and unexplained weight gain. Just as alarming is research that Minoxidil can in some cases actually accelerate hair loss. Minoxidil have a disclaimer that, should the product exacerbate hair loss, there is no guarantee that this hair loss will be replaced by new growth! Boots own brand hair loss treatment. Furthermore most of the success stories have come from younger men with fairly minimal hair loss occurring over no longer than 5 years. Our Hair Growth Serum features the award winning Redensyl active ingredient. The positive results obtained during the clinical trials was using 1% Redensyl, our product contains 3% Redensyl, so you can be sure you are getting the best possible chance of success. The active ingredient is contained in a serum designed to enhance delivery and penetration of the active to the scalp. Unlike Minoxidil containing products there are no side effects or health issue associated with the use of Redensyl. Unlike rinse off products which seem self defeating, Redensyl is a leave on product. 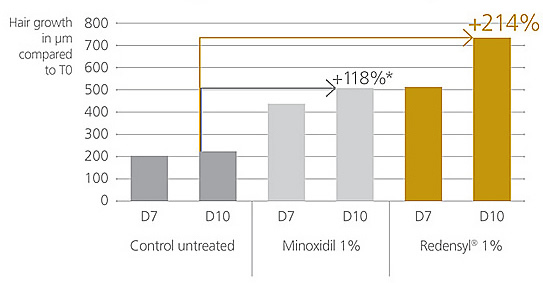 Redensyl was tested alongside Minoxidil and the results showed that Redensyl is 90% more effective than Minoxidil. Hair transplant surgery typically costs in the region of £3,000. On average, one procedure will generate 10,000 new hairs. The new hair growth will occur approximately four months after surgery. A twice daily application of Ana-gen for 3 months (84 days) will generate up to 28,000 new hairs. Of course not all volunteers in the clinical trials experienced a successful outcome. However the clinical trials demonstrated that 85% of volunteers developed significant hair growth. Bear in mind that not all hair transplant procedures are successful. In fact the 85% success rate of Redensyl equates to a similar success rate for surgery. What is there to gain from using this product? We present this option. If you have been thinking about hair transplant surgery then we ask you to consider this. Put the £3000 in a high interest account for three months. Purchase a three month supply of Ana-gen. If, after the three month trial period, you are one of the 15% who may not see significant new hair growth, then take the money out of the high interest account and book the surgery. You'll have earned not far off the cost of the three month supply of Redensyl. If, however, you are one of the 85% for whom the serum promotes new hair growth then you will have saved £3000 and avoided the pain. This product treats hair loss as a result of stress, hormones and ageing. An ever more common cause of significant hair loss and ever more prevalent amongst women is as a result of damage to the hair follicles through the over use of hair extensions or dye's. A woman may use hair extensions to compensate for already thin hair. As the woman relies on extensions to give volume to her hair she will likely experience further thinning of the hair and so relies ever more on the hair extensions. Eventually a situation arises where the woman's hair is so badly damaged that she can not stop using hair extensions. Their role is no longer to add volume to the hair but to hide bald patches. Very often the only option was for expensive and painful transplant surgery. Now there is another option. Redensyl is recommended for use on the eyebrows. Over plucking can cause the eyebrows to simply stop growing. Ana-gen can re-activate the dormant hair follicles and gradually restore the eyebrows. Directions of use: Apply one or two drops (0.8 mL to 1.6mL) by parting your hair and apply directly to the scalp in the areas that are thinning or gray. Massage in with fingertips into your thinning hair scalp twice a day for the first two weeks then once daily thereafter, ensure that as much of the serum as possible is applied to the scalp rather than the hair shaft, then wash your hands well. Keep the product on your scalp, allow to dry, do not wash off your scalp. May also be applied to the eyebrows. 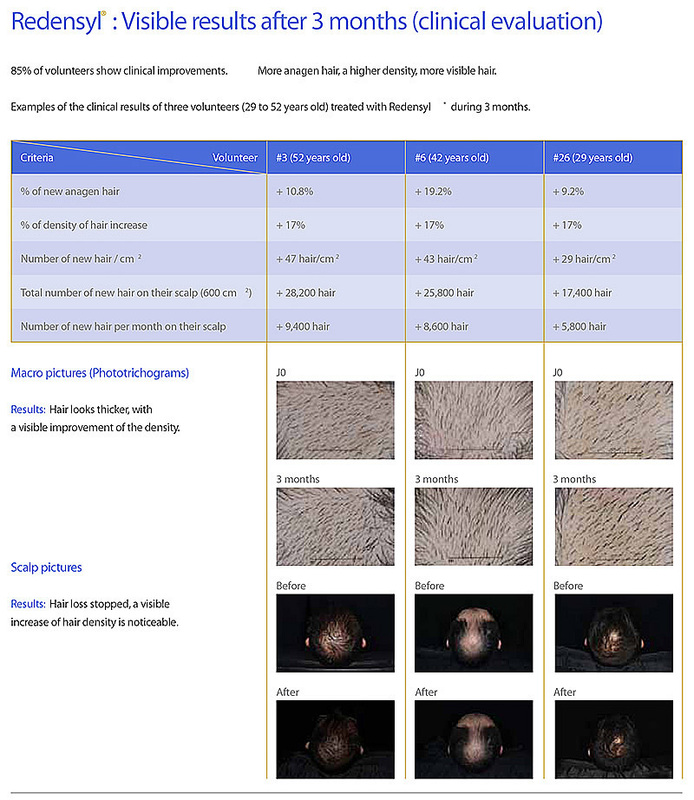 Since hair growing cycles can take at least one to four months, it will take over three to six months of using Redensyl to start to notice beneficial effects. Remember that results from any legitimately effective hair loss treatment can take three months of continued use to begin, and for optimal results to be reached may take one to two years since the anagen, or growing phase of the hair is at least two years in duration. Ingredients: Water, Glycerin, Sodium Metabisulfite, Glycine, Larix Europaea Wood Extract, Zinc Chloride, Camellia Sinensis Leaf Extract, Butylene Glycol, Acetyl Tyrosine, Proline, Hydrolyzed Vegetable Protein, Adenosine Triphosphate, Hyaluronic Acid Hyaluronic Acid Cross Polymer, Sodium acrylates copolymer & Lecithin, Methylpropanediol, Caprylyl Glycol, Phenylpropanol, Redensyl and Uni-protect T-43 .